On Glenn Beck's show of 6/29/10 on Fox, Beck played a video of President Obama at the G-20 meeting in Canada last weekend; and Obama's words really set Beck's "Marxism" alarm off. Obama: A strong and durable recovery also requires countries not having an undue advantage. I think we all have the same interest, and that is the United States compete with anybody as long as we've got and even playing field. One of Beck's frequent tactics is to quote people out of context. The President's entire speech at the G-20 Summit is available for your interpretation at whitehouse.gov. Beck connected two sentences of the speech that were not connected. Obama was answering a questing and addressing rules for trade, not redistribution. 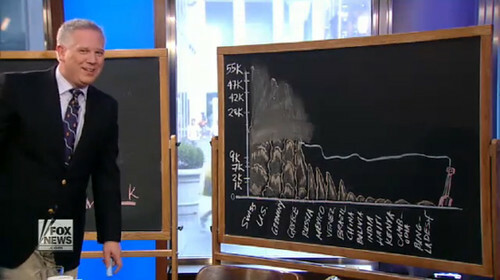 Beck went on to explain what that is going to mean starting with a chalk board chart showing the incomes from around the world. At the top was Switzerland at $55,000 followed by the U.S. at just over $47,000. First, Beck's numbers were wrong. In nobody's analysis of the data do the Swiss have the highest incomes in the world. According to Nationmaster.com, Luxembourg is the highest at $37,500 per person with Switzerland second at just under $37,000 per person and the U.S. fifth at just over $33,000 per person. According to seikhenn.tripod.com Bermuda is #1 at just under $70,000, with the Swiss at 18th place with $32,300 per person and the U.S. is 6th at $41,800 per capita. According to success-and-culture.net, Luxembourg is highest at $54,430 per capita, the Swiss are 7th at just over $32,000 and the U.S. is 3rd at $37,500 per capita. Beck continued to demonstrate how leveling of incomes around the world would lead to everyone making $14,600 per person, the amount shown above the line below. He claimed that this would result from implementation of Cap and Trade, and that George Soros would make money from this by "taking a cut." (Beck calls Soros "evil" and doesn't miss an opportunity to make baseless claims about him.) In the upper right hand corner Beck wrote "Had enough?" Many people have had enough of Beck misinterpreting virtually everything the President says because of his reactionary bias. You can say so.You can send Fox News an e-mail, but using their toll-free number will be harder to ignore. The Fox "Channel" is listed as comments@foxnews.com. It's easier for them to ignore e-mails that it is a call. If you've had enough of Glenn Beck, tell Fox. From the Fox website: "We want YOUR input! Tell us what you love, tell us what you hate...just don't keep it to yourself!...if you're more of a phone person, you can call us at 1-888-369-4762." Choose option 3 and then 1 and leave a message for Roger Ailes. With Beck still losing advertisers every week, a little public pressure might be enough to have Fox rethink Beck's value to their brand name. Glenn Beck is a charlatan, and this is just another example of his purposeful distortion of the President's words to undermine Obama and sow the seeds of fear in his audience. * Update, 2/12/11: This editing of the President's speech, the first sentence from his opening remarks and the second from Obama's answer about trade with China, was not a misinterpretation. This was flat out deception, conscious and purposeful. It is some of the most irresponsible piece of propaganda seen by The Review to date. It was also picked up by a guest blogger at News Hounds(1) and by the blogger at Why I don't like Glenn Beck(2). Why aren't there any comments here yet? Not including mine of course. Through what spectacles should I watch this? Because you're the first to comment on this post. Anonymous, use the spectacles you choose. Lots of clips taken out of context; classic Beckian strategy. Look, health care reform is needed to prevent the health care ins. companies from continuing to screw their customers. What we got was a bill that shovels more public money their way. We needed a public option and got modified corporate health care insurance. Freedoms are being threatened, but by war as usual, not by domestic reforms that solve problems. That's what spectacles I see that video through. The health care bill is bad for all of us. If the congress would move to let health insurance companies compete across state lines and regulate the return on investment. The free market would fix itself. Just like auto insurance, each company would be forced to take a number of pre-existing conditions. Look at the airline industry, fares have been driven down through competition. Anonymous. You state the Republican/Tea Party position on health care well. Of course, it has nothing to do with how Beck extracted two unrelated sentences from Obama's G-20 press conference and then twisted - for the purpose to misinform his viewers - the words to claim they meant something they did not. Should you come back here, find your spine first and use your real name. Then address the topic of the post you are commenting on. Editing of Obama’s speech: I sat through that entire boring speech. Yes, Beck edited it. But I don’t see how that changed the nature of what Obama said. Sometimes, you do this sort of editing to add emphasis. But in the end it didn’t actually change the meaning of anything Obama said. Honestly, I don’t believe it was warranted. But I don’t believe it was deceptive. So, this is just characterization—just as you characterize the editing as deceptive. And characterization is all opinion, not fact. Go ahead and disagree with the opinion all you want. But you put this site up stating you found where his FACTS were wrong. So, let’s plow ahead. It does not mean that the players end up being equal. Perhaps Beck lives in a parallel universe. If playing a game of football, both sides want an even playing field. But both sides hope they will win. In a trade situation, that rarely happens in an even playing field. Some countries laws simply allow for better chances at success than others. So, how can we trade and make results equal? You’re playing with words and discussing phrasing, etc. True you mentioned his method of communication. But this has nothing to do with a FACT that he got wrong. And it is becoming increasingly obvious that you are as guilty of the same characterization, interpretation, deceptive methods of communication that you accuse Beck of. At the top was Switzerland at $55,000 followed by the U.S. at just over $47,000. It was obvious that the board was not big enough to have all 100+ countries around the world on it. He was picking some big name countries. So, he didn’t have Luxembourg. How many people would include that nation on a short list of countries around the world? This was making things concise, not deceiving. Besides, why would that particular “deception” be useful in any way. The point would have been made no matter what country it was. First, Beck's numbers were wrong. No, in international economic analysis, the income of a country can be determined by two methods, Purchase Price Parity, or by Official Exchange Rate. The numbers you gave were more indicative of PPP, Beck’s of Official Exchange Rate. And again, what purpose would a “deception” in this case have made. The point he made in that broadcast would still have been valid if he used your numbers. That is approximately the per capita GWP, depending on which method you use and what year we’re talking about. He could have been researching for six months or more and gotten data from the beginning of his research. I’m trying to focus on the facts you’ve presented. I’m not impressed. It is mostly characterization. Granted, you have proved that Beck is highly guilty of characterization. That is something he should tone down. But it seems that is all you are doing as well. And you call HIM a hypocrite? Carb, Obama was not talking about income. Beck quoted him out of context to LIE about what the President was discussing, you no about of rationalization on your part will change that fact. You're not impressed because you're a gullible supporter of this deceitful propagandist. As you can see in the update, I'm not the only one who caught this bit a sleazy deception that Beck pulled. Obama was talking about rules for trade with China, and if you saw the whole speech and Q & A you'd know that and feel embarrassed about supporting such an obvious liar. If there is "characterization" involved here, it is Beck's characterization of the President who wants to level incomes because he is, Beck indicated, a "Marxist." Yes, I call him a hypocrite, but not for "characterization." Beck IS a liar. That's a fact that Beck has proven elsewhere, and all of the pretenders defending his lies don't change the fact that Obama was talking about something that Beck ignored. The purpose of Beck's lie? To paint this President as a Marxist radical even though he's a corporatist and a liberal (reformer). Beck is guilty of mischaracterization, here and all the time on his show because he is a deceitful propagandist, a gifted propagandist that has fools going around trying to defend his obvious lies, his quoting out of context and his sheer ignorance about the world. Excellent. A very simple fact. No characterization. No name calling. This is true. I cannot dispute that. 1) “Undue Advantages” was at the beginning of the speech. “Even playing field” was in the Q&A section. This might seem out of context until you hear Obama’s comments on the even playing field with reference to China. He himself points out the advantages that China has in our trade with them. This is why he wants the even playing field. And I might add (just so you know I’m not simply an Obama hater) he had some very good points with regard to tariffs, state owned/subsidized businesses, etc. I thought that was a very good point the Pres made. And we should pay attention to these issues. 2) Where was the lie? Did Beck ever say “Obama spoke of income”? No. He didn’t. Beck simply *concluded* that if we are to achieve this even playing field, that we would have to equalize income. I agree this conclusion probably wasn’t warranted. In fact I admit it has very little to do with what Obama said in that speech. And I don’t agree with it. But that was just a bad conclusion. That is not the same as a lie. He never said anything about Obama addressing this in his speech. He said,”he said something that made my Marxist radar go off” or something like that. See, characterization, yes. Lie, no. Ok, I was impressed with that first statement. Now you’re just name-calling. “Gullible”? Where is your basis? It usually isn’t a wise tactic to start name-calling when you know nothing about a person or his motivations. I only listen to Beck about an hour a week. There are at least three others that I listen to on MSNBC and CNN more than that per week. I like to get all sides. That’s how I came across your website. I’m actually in the middle category you describe. Oh, yes, I’m familiar with him and his antics. But I’m not exactly a “supporter”. I was looking for someone who actually did the research and put things together in a clear concise manner so that I could hear the FACTS on why so many people say he lies and so forth. Show me the FACTS. When you issued your “CHALLENGE” to refute your facts, I couldn’t resist. I’m the guy that always looks stuff up on Snopes, Politifact, etc. before forwarding on those emails. So, I thought I’d take you up on your challenge. I’m not impressed because you’re still using names and characterization. You have given me precious little by the way of facts. Can you actually give me a logical argument based on fact rather than characterization and name-calling? 1) Does not practice what he preaches. 2) Holds himself up as a “holy” figure with regard to that topic at hand. This does not mean that he does not have faults. But the things that he takes extra time to preach about with the “high & mighty” attitude is what he himself is guilty of. If you continue throwing out characterizations instead of facts, you are being a hypocrite because that is what you are taking so much time to criticize Beck about. Show me you’re better than that. Give me real arguments. That question was specifically with regard to the numbers used for income around the world. You took what? Two, three paragraphs showing where his numbers were wrong? What was your point? The numbers were close enough for the purpose of illustration. And his point would still be valid using your numbers. It was an illustration. Besides, as I pointed out before, there are several factors in calculation that could easily account for the small discrepancies that you highlighted. I do need to add one more note, in case I get misinterpreted. Beck did refer to Obama's well-stated position that we need to "spread the wealth". But it was pretty clear that he wasn't talking about the G20 speech, but just his already known position on wealth distribution. He then mentions that he also believes we need to spread the wealth globally, not just nationally. He's made a case for it. I'm not exactly convinced of it. But given other things about Obama, I'm not ruling it out. "Carb," the lie was in Beck's detection of "Marxism" in Obama's words. The lie was in turning Obama's words into an entirely different subject, and the lie was in deceitfully editing the video to make it seem as if the two sentences were together. Beck's lies are often the creation of a false narrative. False as in not true, and not true as in deception. Deceptions, purposeful and conscious deceptions, are a form of a lie. "Carb," you're embarrassing yourself, a "blogger" since...hmmmm this month! what a coincidence! You can't embarrass yourself because no one knows who you are. Anonymity allows you to defend deceptions (lies) without ever having to held accountable for your delusional defense of a well-known liar. My point about showing that Beck had his numbers wrong for average income is that he is both a liar and makes up data. He is an ignorant liar, and I'm hardly the first blogger to point this out. I hope Obama wants to spread the wealth nationally because there has been a redistribution upward for the last 30 years. If we don't reverse this, we're going to become a country in steep decline with two large classes: the right and the poor. The middle class will become very small if progressive taxation (a Christian and popular idea as well as a Marxist one) is not employed to deal with the debt (rather than programs that help people get into the middle class). Carb, I wonder how wealthy you are. 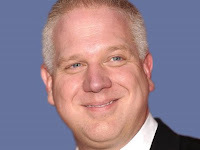 Are you defending your own interest or undermining them by defending the purposeful lie of Glenn Beck? I had hoped you were different. I had heard so many people say Beck lied, distorted, whatever. With as little as I actually tuned, in I was curious. I found him interesting. And I also saw him be a little crazy. But I always enjoy a sense of humor no matter who it's from or from whatever part of the political spectrum. I didn't accept his words at face value. But I didn't accept other people calling him a liar either. So I went on an expedition. What were the lies? Every site I went to that called him a liar said they had a case. I was going to look at the case and make a decision. And one by one, I found that each site went on a tirade about him, but never brought any case against him. There were no examples. The few cases where there were examples the case was simply,"well that just isn't true." Usually, when you say that, you're supposed to provide the "real" fact with source material to back it up. But none of these guys did. When I got to your site, I was excited. Here was a guy who actually showed the examples and had item by item commentary. Then you had parts where there were real facts that Beck was wrong about, and you showed the correct fact on it. Then I started my detailed analysis. I've been looking at codes and specifications for over 15 years. So, I'm familiar with studying every word and meaning from different points of view and possible interpretation. I gave you my logical, non abrasive analysis. And you just can't keep from calling me names. The argument "your embarrassing yourself" whenever you disagree with someone is not an effective argument. I'm asking for something better. But if you won't provide a logical debate that isn't laced with personal attacks, I'll go elsewhere. Your question about my wealth level is interesting. Do you automatically judge a person based on wealth? If not, what does it matter? I'm not trying to defend Beck. I'm trying to get to the truth. So can you actually put up a decent length post without name-calling or personal attacks? BTW, I've been blogging for about 4 years now. I left some time ago to work overseas until a few months ago. I'm slowly setting up accounts again. My Google Account expired. Also, I'm unemployed with six kids. But I'm not defending or undermining anyone's interest, including my own. I'm just interested in the facts whether they help me or damn me. I'm interested in the truth. If that ends up hurting me, at least I'll be hurt by the truth and not a lie. If I find a lie that would help me, I just wouldn't feel right about using it to help me. I may have desires and goals. But I'm not picking up a lie just to help me. I want it to be the truth. I'm not completely against "spreading the wealth". But I'd like to know the mechanism by which it is done. Most of the time, the "spreading" occurs in such a way that the rich still get richer. Look at social security. We all pay 7.5% except the wealthy. The wealthy only pay 7.5% on their first what $105k or so this year? What about the other $Millions they make? Why don't they pay on that? Because the wealthy make the rules. Being a Democrat doesn't help either. Bill Gates, Steven Speilberg, Oprah Winfrey are all very wealthy Democrats, but they don't pay anywhere near the taxes and fees that we do. Spreading the wealth has never been about spreading the wealth when the wealthy are the ones making the rules in the first place. Whether the Democrats are in power or the Republicans, they've NEVER passed legislation to get that 7.5% from the wealthy. If we're going to spread the wealth, let it be a true distribution. The Stimulus and Bailouts, for example, gave a whole lot of money to corporations. How much actually got to a poor guy like me who wanted to start a business? I went to my Congressman to ask how to apply for something. He said I couldn't. Why? He went through a laundry list of rules, etc. I realized very quickly that only a wealthy business would qualify. And this was passed by a Democrats and Republicans alike. Why not just take that money and divide it by the number of social security numbers on file and just send out checks to EVERYONE? THAT WOULD BE TRUE WEALTH DISTRIBUTION. But they'll never do it because it's all just a lie. Keep an eye out on whatever distribution occurs. We'll get a small check (maybe). But the majority of the spreading will go right back to the wealthy. Whether it is Warren Buffet and Bill Gates (Democrats) or the Koch Brothers (Republicans) they'll all make sure they keep theirs. Carb, you seem reasonable enough, so you tell me why you can't grasp the four deceptions here. 1) Beck had his data wrong about average, world wide income (no big deal). 2) Beck's team edited the video to present the two sentences as back to back when they were from separate and unrelated sections of the press conference. 3) Beck took the phrase "level playing field" and presented that as if Obama were talking about incomes and not rules of trade with China (the biggest lie) and 4) distorted what level playing field means. It does not EVER mean equal results. When people refer to income opportunity, those who want a level playing field are liberals generally supporting equal opportunity. Those who refer to equal results, equal income, are radical Marxists, and few of them would call for total equality where janitors make the same as surgeons. Beck's interpretation was just absurd! Beck's array of deceptions had and have an agenda, to rouse the ire and the rabble of his audience, to divide the country against this president and render him "other." He's not one of us, he's "other." Even if Beck had his facts right about the world wide average income, he used that fact to create a false narrative, that the President is radical and one of "them," not one of us. This is typical for Beck, not just an exception in this one case. If you comment again, I'd like the URL to your blog. Carb, the wealth distribution you recommend would not have fixed the roads, repaired the libraries or computerized the medical records. It would have done nothing to invest in green energy as the stimulus package did. What you recommend would have purchased a lot of cigarettes, drugs and alcohol. It would help the economy, but not fixed the many problems that we still have with the country's infrastructure. Wealth distribution is not intended to do those things. All it is supposed to do is give people a similar income. Nothing else. Those issues you recommend are not wealth distribution. They are social programs. The topic was specifically about wealth distribution. a) Close enough to be accounted for by differing methods of commonly accepted accounting practice. b) Close enough to the numbers you provided that it did not change the point he was making. (Whether you agree with his point or not, the differences in numbers would not have changed the argument). I pointed this out before. a) Yes, they were from different sections of the conference. b) It did not change the meaning of the President’s words. Obama himself related the two phrases with his own words in the Q&A section. As he made the statement about an “even playing field” he pointed out the “advantages” that China had over the US. But the explanation was too broad for a sound bite. The earlier statement was simple enough to edit in. Editing pieces like this is done all over the media as a common practice for brevity and clarity. If you condemn Beck for this, you must also condemn many others on all points along the spectrum. It only becomes deceptive if the editing is done to “Change The Meaning” of what was said. Since the Pres. spoke of the advantages when he spoke of the even playing field, this certainly didn’t change the meaning. Additionally, the editing had a definite “flash” between scenes. This is a common technique used all over the media to alert the viewer that there was a cut. I’ve seen many where they gave NO signal except a “choppy” image. The flash is a valid way of announcing an edit. When I first saw it, it was pretty clear to me that they made no effort to hide the fact it was edited. My concern is only if it changed the meaning. And I believe I’ve shown it did not. This is true. What looms in my mind is that he has some “wiggle room” because of the way he presented it. I’ve described that already, but you’ve blown it off as “justification”. I consider it a third party being uncertain about his intent. You could be right. But I’m uncertain. I’ve addressed this as well. He didn’t say level playing field = equal results. He said that the “logistics” by which an even playing field would be accomplished would be by creating equal results. I don’t agree with that. But that is what he said as his interpretation / conclusion. Again, I agreed it was a poor conclusion. Perhaps ignorant. But if he really believes it, it isn’t a lie. It’s just ignorance or poor judgment. I’ve got a large extended family that goes all over the spectrum. It’s fun to bring up politics during holidays. Often times, I just sit and watch. From this vantage point, I have personally heard arguments from far left who DO want a janitor to make the same as a surgeon. And she does not consider herself a Marxist. Granted, she’s pretty far left. But she swears up and down that she is not a communist. Like I’d said, I was out of the country for over a year. All my stuff is gone. I’m setting stuff up again. But I’ve got to spend a few more months of reading up on where the country is before I start formulating my own commentaries.